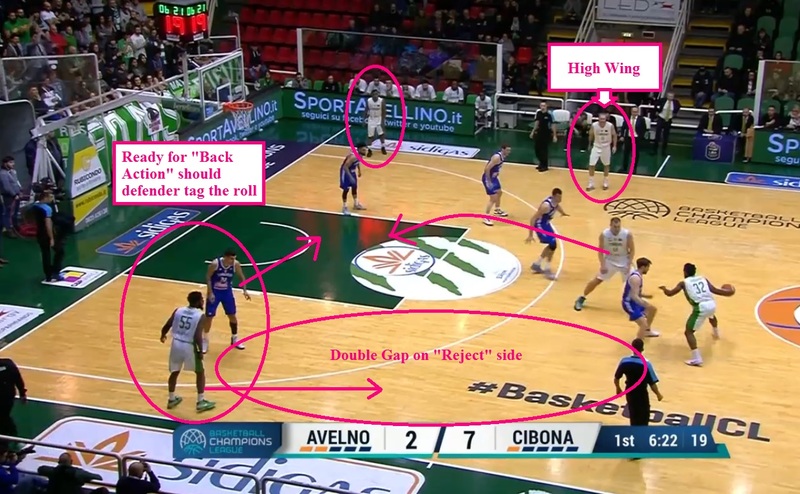 The basics of the Spread Ball Screen alignment – a good starting point for the introduction of ball screen offense. Getting into ball screen offense can be done in multiple ways. 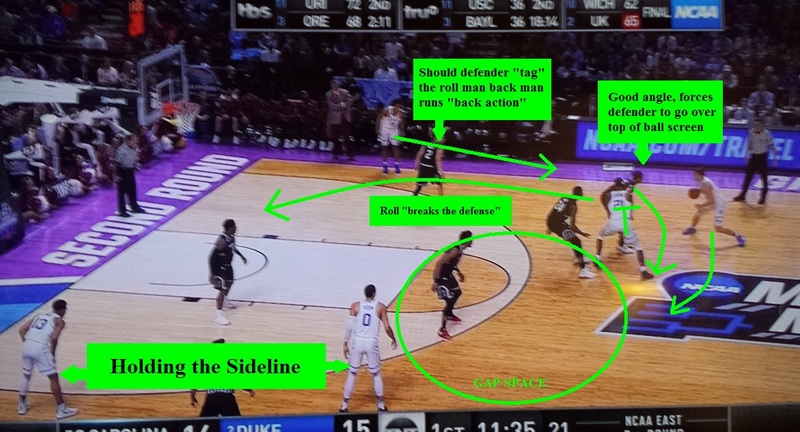 A common alignment for the introduction of ball screen concepts is the Spread Ball Screen alignment. It is popular worldwide and at all levels of play. 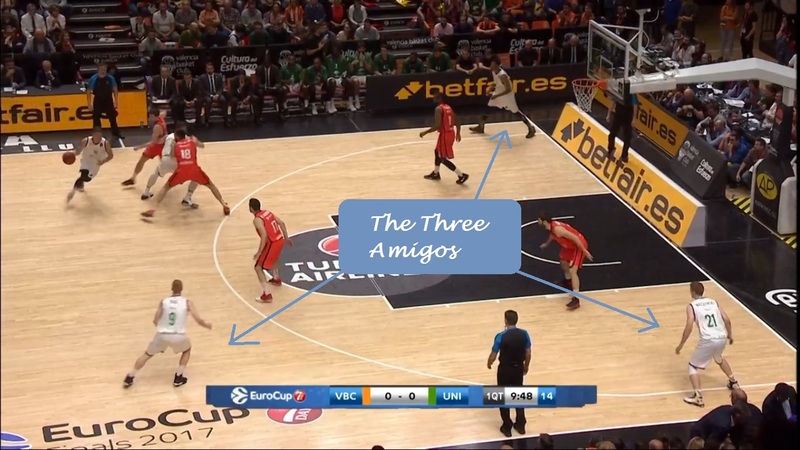 Below are examples of teams from NBA, FIBA, NCAA and the international professional ranks demonstrating the quintessential Spread Ball Screen alignment. 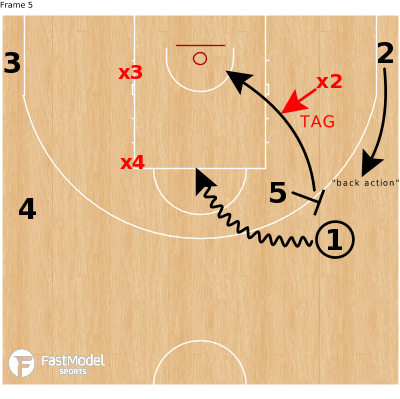 In this summary of Spread Ball Screen – Basics we will examine how to enter the alignment seamlessly, learn basic terminology and assignments and pose questions which guide players toward finding the player for whom the ball screen gave the advantage. Offense starts at the rebound/inbound. 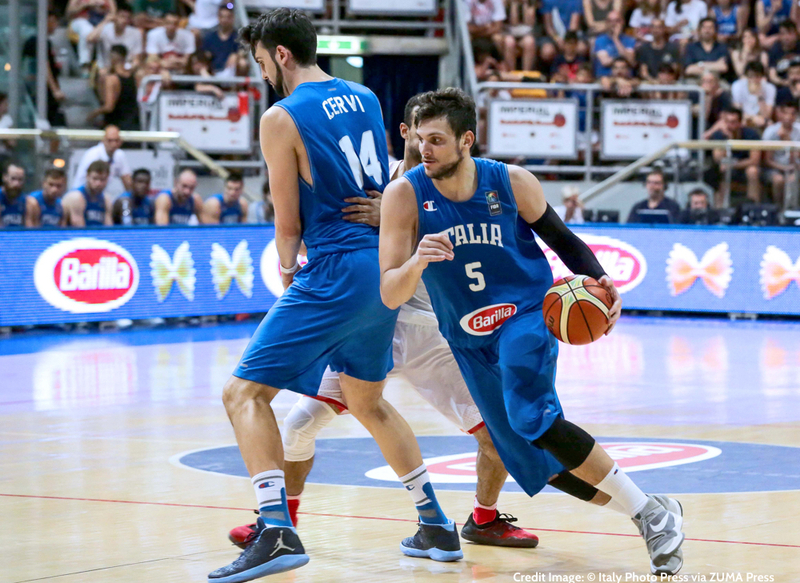 Many design their transition offense to enter the Spread Ball Screen alignment seamlessly in Early Offense. Doing so means assigning lanes for each of the five players. The terms above have a “transportation” theme and a “movement” connotation. Outlet or inbound as high and wide as possible. Two players, usually wings, sprint inside the RAIL (think “high speed rail” like a bullet train) to the deep corners. This “deflates the defense” and forces them to recover the full length of the court. While a drag-style ball screen is perhaps upcoming, an advance pass to either of the wings ahead who have an advantage trump that. Always seek to pitch ahead. 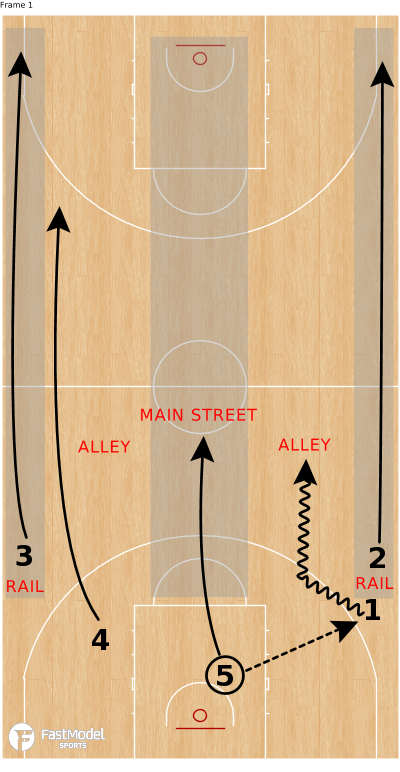 The ball handler advances the ball in the ALLEY that has been carved out for them. A forward fills the other alley and MAIN STREET belongs to a post. 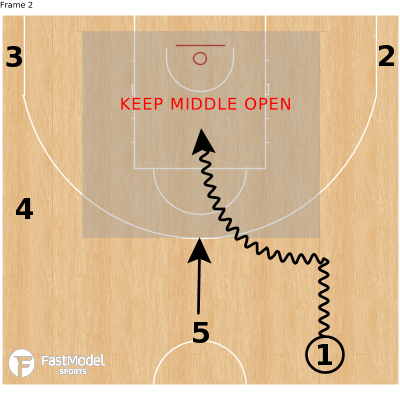 By design, the middle is open so the ball handler can attack, disorganize and collapse the defense with dribble penetration if a lane is available. Should no advantage be available and no dribble attack made, the offense arrives on the scene ready to create an advantage using the ball screen and the Spread Ball Screen alignment. Below are the basic spots and terminology for the Spread Ball Screen alignment. Terminology may vary from coach-to-coach but using descriptive and consistent terms matters most. Corner = fill the two deep corners of the court. Corner players should be even with the side of the rim beyond the three-point line. High Wing = even with the top of the circle. NOT free throw line extended! 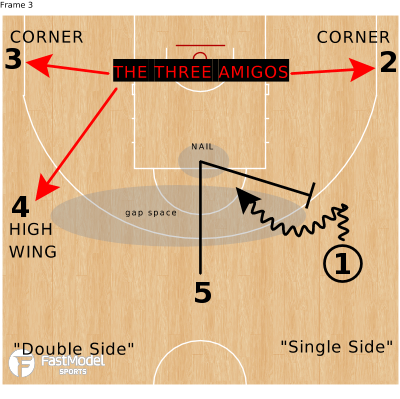 Single and Double Sides = there are two hemispheres of the court one is filled with two of the “amigos” (double side) and the other with one “amigo” (single side). When using the Spread Ball Screen alignment there are other principles to consider. The screener should get below the plane of the ball before setting the ball screen. This sets a screening angle that induces 1’s defender into going over the ball screen. 1 can now get downhill and disorganize the defense. Toeing the three point line would suffocate the gap space and allow 4’s defender to give quick help and quick recovery. 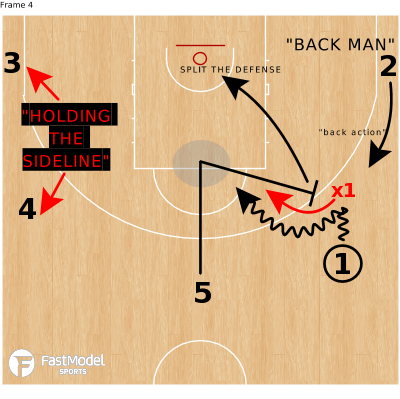 In the diagram above, 2 is the “back man” or the player behind the direction of the ball handler should they accept the screen. Often when 5 “splits” the defense with the roll it is X2 who “tags” the roll man to neutralize this threat. Borrowing X2 presents an advantage for 2 who would then run “back action” and lift toward the wing. Once the ball screen is set the catalyst for the advantage has been activated. Reading the defense and making the proper decisions leads to scoring opportunities. There are many reads and this is no way a comprehensive list as there are multiple ways defenses may defend the ball screen. But these are the basic questions to guide your players. Can I reject the screen and get to the rim? Can I score? If yes, do it! If no, who stopped me? Where’s his/her man? Is the roll open? If no, why not? Who tagged? Where’s his her man? Amigos: Did my player help, seal the drive or tag the roll? Again, this is not a comprehensive list for all coverages, but using questioning helps players arrive at the proper level of understanding necessary to find the player with the biggest advantage. The Spread Ball Screen alignment can be flipped where the “back man” comes from the double side and the ball screen is in the slot. This often comes from “twisting” the screen should the on-ball defender go under the original ball screen. The ball handler now has a double gap on the “accept side” of the screen and would drive to score but anticipate corner help or help at the rim. 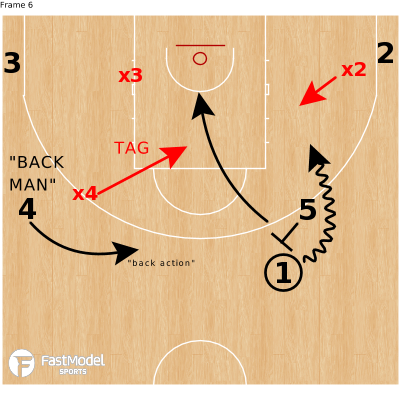 The “back action” would come from the top player on the double side and can lead to a quick shot or a 2v1 opportunity for 4 and 3 versus X3. The same questions as above apply to the reads. Using this basic Spread Ball Screen alignment as a starting point keeps the floor open and lets the ball screen do the work. The spacing, concepts and assignments allow players to know what they are seeing and exploit the decisions the defense makes to neutralize the advantage. Once the advantage emerges the offense is then tasked with finding it, maintaining it and increasing it until a good shot is located. Any questions, email randy@radiusathletics.com. Happy to talk hoops any time day or night! Sign up here for our twice-monthly newsletter for basketball coaches!